Strategic Outcome: Canadian stories and perspectives are reflected in audiovisual media and accessible to Canadians and the world. Departmental Performance Reports are part of the Estimates family of documents. Estimates documents support appropriation acts, which specify the amounts and broad purposes for which funds can be spent by the government. The Estimates document family has three parts. 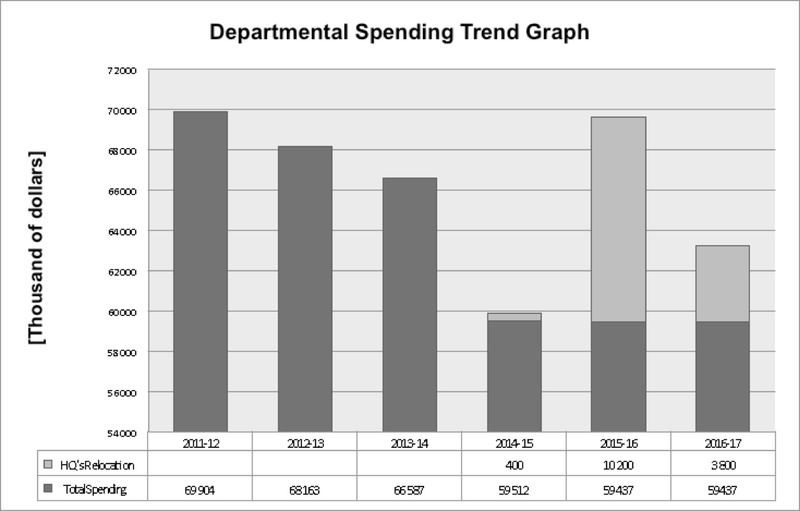 Part III (Departmental Expenditure Plans) consists of two documents. Reports on Plans and Priorities (RPPs) are expenditure plans for each appropriated department and agency (excluding Crown corporations). They describe departmental priorities, strategic outcomes, programs, expected results and associated resource requirements, covering a three-year period beginning with the year indicated in the title of the report. Departmental Performance Reports (DPRs) are individual department and agency accounts of actual performance, for the most recently completed fiscal year, against the plans, priorities and expected results set out in their respective RPPs. DPRs inform parliamentarians and Canadians of the results achieved by government organizations for Canadians. The financial information in DPRs is drawn directly from authorities presented in the Main Estimates and the planned spending information in RPPs. The financial information in DPRs is also consistent with information in the Public Accounts of Canada. The Public Accounts of Canada include the Government of Canada Consolidated Statement of Financial Position, the Consolidated Statement of Operations and Accumulated Deficit, the Consolidated Statement of Change in Net Debt, and the Consolidated Statement of Cash Flow, as well as details of financial operations segregated by ministerial portfolio for a given fiscal year. For the DPR, two types of financial information are drawn from the Public Accounts of Canada: authorities available for use by an appropriated organization for the fiscal year, and authorities used for that same fiscal year. The latter corresponds to actual spending as presented in the DPR. The Treasury Board Policy on Management, Resources and Results Structures further strengthens the alignment of the performance information presented in DPRs, other Estimates documents and the Public Accounts of Canada. The policy establishes the Program Alignment Architecture of appropriated organizations as the structure against which financial and non-financial performance information is provided for Estimates and parliamentary reporting. The same reporting structure applies irrespective of whether the organization is reporting in the Main Estimates, the RPP, the DPR or the Public Accounts of Canada. A number of changes have been made to DPRs for 2013−14 to better support decisions on appropriations. Where applicable, DPRs now provide financial, human resources and performance information in Section II at the lowest level of the organization’s Program Alignment Architecture. In addition, the DPR’s format and terminology have been revised to provide greater clarity, consistency and a strengthened emphasis on Estimates and Public Accounts information. As well, departmental reporting on the Federal Sustainable Development Strategy has been consolidated into a new supplementary information table posted on departmental websites. This new table brings together all of the components of the Departmental Sustainable Development Strategy formerly presented in DPRs and on departmental websites, including reporting on the Greening of Government Operations and Strategic Environmental Assessments. Section III of the report provides a link to the new table on the organization’s website. Finally, definitions of terminology are now provided in an appendix. The Department of Canadian Heritage and its portfolio organizations, including the National Film Board, contribute in many ways to Canadians’ quality of life. Together, they support our country’s creators, showcase their talent and encourage their sense of innovation, including in the digital world. We also help foster the creation of an environment in which all Canadians can enjoy diverse cultural experiences while also preserving and celebrating our linguistic duality and rich heritage. As we prepare to celebrate the 150th anniversary of Confederation, in 2017, we can be proud of these institutions at the heart of the cultural, social and economic lives of our communities. They help make Canada a creative country that is both proud of its past and focused on the future. As Canada’s public producer and distributor, the NFB creates innovative media works from every region of the country, opening a window onto the people, places and events that shape Canadian culture and history. The NFB’s productions touch the soul of the nation, reflecting the stories and lives of Canadians from all walks of life. On the cusp of its 75th anniversary in 2014, which it will be celebrating with the theme “A History of Looking Forward,” the NFB continues to build on its legacy as a 12-time Academy Award-winning pioneer at the forefront of advances in audiovisual media. Sharing diverse cultural experiences and capturing the essence of Canada are at the heart of the NFB’s mission, but its works also stretch the imaginative limits of both artists and audiences, paving the way for the creativity and innovation of tomorrow’s media players. As Minister of Canadian Heritage and Official Languages, I am pleased to present the Departmental Performance Report, 2013–14, for the National Film Board. This document provides a detailed description of the NFB’s accomplishments over the past year. I invite you to review this report’s contents to learn more about the initiatives it has undertaken with a view to fulfilling its mandate, supporting our Government’s priorities and serving Canadians from coast to coast effectively and diligently. The 2013–14 fiscal year marked the beginning of a new chapter for the National Film Board―the first phase of our 2013–2018 Strategic Plan. Drafted following extensive consultations with every branch of the NFB, the plan calls for a greater focus on innovation and creativity, stronger engagement with Canadians in all of our activities, and ongoing improvements to the ways in which we work together as a team and manage our resources. The NFB’s pioneering work in programming, online, and in the development of apps has helped position Canada at the forefront of film and digital media innovation. In 2013–14, that work was recognized with a total of 111 awards: 43 Canadian and 68 international honours. One of the key goals of our programming strategy going forward is to more actively and critically focus the objectives of our point-of-view filmmaking, establishing a distinctive identity for NFB documentaries. This emphasis was already well evident in the remarkable slate of NFB feature docs produced in 2013–14. In addition, as a world-renowned source of auteur animation, the NFB continued to support and explore new creative avenues in this form, even as we prepared to mark the centenary of the birth of NFB animation pioneer Norman McLaren. But the NFB is not new to the role of innovative storyteller; over the course of seven-and-a-half decades, the Board has chronicled authentically Canadian stories from every part of the country―points of view often overlooked by traditional media organizations―and has shared these rich narratives with all Canadians. In 2009, our online Screening Room, NFB.ca, became the new standard in digital accessibility for our country’s culture and history, and our Strategic Plan stresses the need for even greater accessibility—the need to increase the presence, awareness and impact of the NFB’s works by enhancing our connection with Canadians and world audiences, in classrooms, communities, cinemas, and on all the platforms where audiences watch, exchange and network around creative content. To that end, the NFB’s growing online and mobile audience reached another milestone this past year: more than 54 million views of NFB content via our online Screening Room, our apps for smartphones, tablets and connected TV, and our international partner platforms. We continued to implement our digitization plan―which will eventually see our entire collection digitized―and also began discussions with partners here in Canada and around the world on an ambitious initiative to expand NFB.ca into a family of user-oriented online channels. We’re now exploring how best to supplement our traditional Internet presence with new online hubs tailored to the tastes of animation and documentary buffs or offering other types of programming that will allow us to grow our online revenues. As we embark on our 75th year as public producer and distributor, the NFB has a renewed commitment to transforming how we work and create in order to better serve Canada, engage with Canadians on the issues and stories that matter, and position this country at the cutting edge of innovation in the digital media age. The 2013–14 Departmental Performance Report details many of the activities and accomplishments touched upon above and provides a valuable overview of the strides we’ve taken towards achieving the key objectives of our Strategic Plan. Appropriate Minister: The Honourable Shelly Glover, P.C., M.P. Other: The NFB Board of Trustees is currently composed of seven members: the Government Film Commissioner, who acts as the Board’s chairperson, the Executive Director of Telefilm Canada and five other members appointed by the Governor in Council. With the exception of the Commissioner and Executive Director of Telefilm Canada, Board members serve three-year terms. The Board’s primary role is to define the NFB’s broad directions and approve its budgets and strategic plans. The National Film Board of Canada (NFB) was created by an Act of Parliament in 1939 and is a federal agency within the Canadian Heritage portfolio. The NFB’s mandate is to produce and distribute original and innovative audiovisual works that add to our understanding of the issues facing Canadians and raise awareness of Canadian values and viewpoints across the country and around the world. Over the decades, it has become the standard for audiovisual innovation in Canada and plays an important role by highlighting the changes and key events in Canadian society. As a producer and distributor of audiovisual works, the NFB provides a unique perspective on Canada’s cultural wealth and diversity. The NFB explores contemporary social issues through point-of-view documentaries, auteur animation and new-media content. Over the years, the NFB has played an important role in marking the major changes and events taking place in Canadian society. As Canada’s public producer and distributor of audiovisual works, the NFB documents the history and culture of the nation for both domestic and international audiences. Over the past 75 years, the NFB has produced more than 13,000 works and received more than 5,000 awards, inspiring and influencing generations of filmmakers in Canada and across the globe. Its audiovisual works offer special insight into the diversity and vitality of our culture and are an essential part of our national heritage. The NFB is governed by the National Film Act1 and a series of other statutes, including the Financial Administration Act2 (which sets out the government’s financial administration structure and process), the Access to Information Act3, the Privacy Act4, the Official Languages Act5 and the Canadian Multiculturalism Act6. As a producer, the NFB carries out its responsibilities by constantly investing in new creative fields in documentary, auteur animation and interactive media. It seizes the artistic and technological opportunities that arise in the media landscape and collaborates with emerging and established filmmakers, creators and co-producers in every region of Canada, with Aboriginal and culturally diverse communities as well as partners around the world. Creativity and social relevance are the core features of its productions. promoting its works to the national and international audiovisual industry. The NFB’s new productions and extensive film collection—the collective memory of the nation—are increasingly accessible to all Canadians, in every province and territory. 1. Strategic Outcome: Canadian stories and perspectives are reflected in audiovisual media and accessible to Canadians and the world. This priority was met in 2013–14 with the completion of 72 original productions or co-productions and 10 interactive websites containing 18 films. These productions reflect a wide range of Canadian stories and perspectives. In addition, two apps for tablets and four installations were launched. A quarter of the total awards garnered at a variety of festivals are considered to be prestigious honours. Over half of the works completed were created by filmmakers from diverse ethno-cultural, regional, linguistic and Aboriginal communities. Almost 30 percent of the works completed were created by emerging filmmakers. Filmmakers from official-language minority communities (anglophone in Quebec and francophone outside Quebec) completed 24 original productions and 6 films for the Web. High-profile partnerships with the following organizations were created or renewed in 2013–14: the Governor General’s Performing Arts Awards (for the sixth year); the Musée de la Civilisation de Québec; the Canadian Space Agency; the Nunavut Film Development Corporation; The New York Times; Arte; France Télévisions; APTN; and the Alliance des producteurs francophones du Canada. 2013–14 was a year of considerable change for English Program, which recruited executive producers for its Ontario, Pacific and Animation studios as well as two producers for its Animation studio. The changes in staffing (including the departure of the Director General) have caused some delays in production schedules. By continuing to implement its Digital Strategy, the NFB is ensuring that it can fulfill its mandate in the future—in programming, distribution, accessibility, business development and conservation of its audiovisual heritage. In order to secure its collection, the NFB transferred 2,458 titles to a separate location. To date, 77 percent of the collection has been secured. The NFB’s digitization plan remains on track. As of March 31, 2014, 55 percent of works in the NFB collection have a corresponding mezzanine file, and 40 percent of the collection has a digital source master. The ongoing technology partnership with North Plains Systems has resulted in the development of the infrastructure needed for the NFB’s digital asset management system. The increased storage requirements resulting from the NFB’s digitization plan have presented a challenge for the NFB’s storage infrastructure. To address this, the NFB acquired a new large-scale tape archive with a capacity four times greater than the current library. Progress towards this priority was satisfactory, with targets reached or on track to be attained by the scheduled date. In 2013–14, NFB productions had a total reach of 35.4 million views worldwide, across a variety of platforms. The NFB’s online presence was expanded with the addition of 320 films on NFB.ca in both official languages. Improved data-management systems were put in place, allowing for better tracking and analysis of user behaviour and transactions on NFB.ca, as well as the capacity to track and report views on new platforms (such as CAMPUS and new smart TV and other apps). A plan to create language-based channels on NFB.ca was not concretized due to a change in strategy and the announcement of a new international documentary streaming platform on NFB.ca. In celebration of the ACIC program’s 40th anniversary, the NFB acquired eight films made through the program and showcased them on NFB.ca. The plan to create an independent film channel has been incorporated into a larger revamp of NFB.ca that will include the addition of an international documentary streaming platform (see above). The NFB’s educational hub, CAMPUS, was expanded in 2013–14 to offer new resources and features such as the playlist-sharing option, chaptering and Learning Bundles. The NFB added 40 of its films to the CAMPUS library and acquired a total of 389 films to supplement its educational film collection. The launch of a version of CAMPUS for the US education market was postponed to 2014–15 due to delays caused by technological challenges. A soft launch is scheduled for September 2014. Overall, the lesson learned is: The better the NFB understands its customers’ online behaviour and preferences, and the better it manages its multiple interactions with them, the more opportunities it will have to increase revenues. A renewal of its organizational culture has allowed the NFB to redefine itself as a leading-edge creative organization and to foster an environment that favours collaboration and openness, encourages leadership, and values diversity and new operational models. Implementation of the 2013–2018 Strategic Plan is the result of a consultative approach adopted by senior management. A series of work meetings were held with managers, supervisors and each employee to ensure a common understanding and appropriation of the action plan. The NFB did not undergo an MAF evaluation in 2013–14. The project to move NFB headquarters was postponed. Measures were put in place to ensure safeguarding of the collection in the event of a disaster. Seventy-seven percent of the collection is now stored in two separate locations. The main risk identified in the Business Improvement Analysis (BIA) is loss of the NFB’s film collection. The NFB achieved elements of its internal communication plan by generally reinforcing the sharing of information, particularly information regarding its objectives for fiscal year 2013–14. In 2013–14, the NFB launched its leadership development program for managers. To date, several training modules have been offered, including “Engaging Communication,” “Optimal Performance” and “SMART Objectives” workshops. The NFB continued to implement the Internal Control Policy in 2013–14 by putting additional controls in place with regard to the Purchasing Policy, Oracle user accesses and the key process for Capital Acquisitions. The NFB is facing ongoing risks. Strategies for mitigating its exposure to these priority risks are aligned with the organizational action plans so that the NFB can take a coordinated approach to managing risks that could affect the achievement of its objectives and the conduct of its operations. 1. NFB relocation: that the NFB’s head office is not relocated. 2. Technological obsolescence and preservation of digital assets: that the NFB loses its digital assets or that the security of its digital assets is compromised. 3. Copyright management: that difficulty in acquiring copyright leads to the inability to use NFB content. 4. Communication with our partners: that a controversy arises stemming from the NFB’s relationship with its partners. The headquarters relocation project has been postponed. The NFB will work closely with Public Works and Government Services Canada (PWGSC) to review the project’s timeframe. The rapid obsolescence of technical or technological equipment is an issue that the NFB must contend with on an ongoing basis, now and in the future. That is why the NFB continually reviews its working methods and equipment in order to remain on the cutting edge of technology. In addition, the plan to digitize the collection that began in 2011 ensures the creation and maintenance of source files, making it possible to deliver products in all current and future platforms. With regard to the preservation of interactive websites, the NFB has implemented a plan to review its digital asset management systems. Among other things, the plan provides for the preservation of all components of interactive websites. Furthermore, the NFB closely monitors industry developments related to interactive site preservation. Acquiring and renewing rights has become a major challenge in a media environment in which content is accessed via digital platforms by both creators and users. The duration of rights agreements, as well as the time involved and the substantial costs of acquiring, for example, Internet rights for numerous works in the NFB collection, mean that the institution risks not being able to use its own content. Compliance with the Copyright Acquisition Policy has improved following implementation of the 2012–2014 Rights Management Action Plan, which consisted of training sessions on rights acquisition given by the Business Affairs and Legal Services team in 2012–2014. NFB senior management is very satisfied with the work done in this regard. The final phase of the Action Plan is to provide targeted training for interactive producers. Copyright files for interactive productions present special challenges. The implementation of a number of measures related to the NFB’s contribution to the Government of Canada’s 2012 Budget has had an impact on our partners. To ensure a climate of confidence, the NFB maintains positive ongoing relations with the production community and its different business partners. A number of interesting partnerships were undertaken in 2013–2014, including the renewal of the Collaboration Agreement for the Development of Arts and Culture in the Francophone Minority Communities of Canada. NFB senior management met with representatives of the Documentary Organization of Canada (DOC), a collective representing the independent documentary community. This important meeting rekindled dialogue between the two organizations. The 2013–14 total authorities available for use include funding for severance pay and parental leave (which is excluded from the main estimates) in the amount of $3.5 million, the 2012–13 carry forward of $2.1 million as well as the compensation amount of $800,000 for the 2013–14 salary reviews of excluded and unionized employees. Of the available total authorities, the NFB is carrying forward $2.7 million to 2014–15, an amount comparable to that of the previous year ($2,103,510) to ensure funding for promising projects such as the revamped NFB.ca and its international documentary channel. This carry forward will also make it possible to fund, in part, the relocation projects of some regional offices (Halifax, St. John’s and Moncton) and to fund uncompensated salary reviews for 2014–15 and 2015–16. Strategic Outcome 1: Canadian stories and perspectives are reflected in audiovisual media and accessible to Canadians and the world. The difference between planned and actual spending stems primarily from funding severance pay and parental leave, which is excluded from the main estimates, having been authorized by TBS at the time of payment. In 2013–14, more than 75 percent of the employees governed by a collective agreement cashed out their severance pay, which stopped accumulating as of 2012. The amounts of the sponsored production agreements with the Canadian Race Foundation and the University of Alberta were higher than anticipated. The Accessibility and Audience Engagement program is continuing to grow in the education sector through the NFB’s online educational offer, CAMPUS, in anticipation of the expansion of this portal to the United States and internationally. The NFB’s digital development and applications sector is also experiencing growth owing to the revamping and repositioning of the NFB.ca online Screening Room and its international documentary channel. Internal Services planned spending for 2013–14 included a reserve for the NFB’s funding of the headquarters relocation project, which has been postponed to a later date. Since 2012–13, the NFB has been implementing measures related to its participation in the Deficit Reduction Action Plan ($100,000 in 2012–13 and $3.3 million in 2013–14). As of 2014–15, spending reflects the permanent 10 percent reduction, for a total of $6.7 million. It was anticipated that the NFB would receive funds from 2014–15 to 2016–17 for the relocation of its headquarters. The project is still awaiting approval, and funds will be renewed in subsequent years within the framework of the 2015–16 Annual Reference Level Update (ARLU). For information on the National Film Board’s organizational Votes and statutory expenditures, consult the Public Accounts of Canada 2014 on the Public Works and Government Services Canada websiteii. This program activity contributes to Canadians’ understanding of the issues facing our country and raises awareness of Canadian viewpoints around the world. As a public sector producer, the NFB produces original audiovisual works that reflect diverse Canadian perspectives, including cultural, regional and Aboriginal, and emanate from the diverse creators and communities that make up the country. This program activity operates where the private sector doesn’t, allowing creators to explore artistic and technological advances in form and content. It also ensures the identification, development and nurturing of talent and creative skills within filmmaking and other creative communities. NFB programming is necessary to ensure that Canadians have access to diverse voices and content in both official languages. It promotes Canadian culture and values in events of national historic and cultural significance. As Canadians’ media consumption migrates online, the NFB provides leadership in the creation of innovative digital content in both official languages. Production activities include the conceptualization, research, development and production of documentaries, animation, new media content and other emerging forms. Several changes in management occurred at the NFB over the past year, including the departure of both the English Program and the French Program Director General in the last quarter of fiscal year 2013–14. Two internal interim DG appointments were made to ensure continuity in the implementation of the NFB’s Strategic Plan and programming objectives. The recruitment process for both positions is expected to be completed by early February 2015. The executive producer in charge of the Studio de la francophonie canadienne took up his newly created role in mid-April 2013. The position will enable the NFB to increase its level of collaboration with francophone artists across Canada. In September, French program management undertook an extensive cross-country tour of francophone communities, meeting with filmmakers, producers, and press and media associations. In addition, the Assistant Commissioner toured Canada’s provinces and territories throughout the year, visiting with nearly 100 francophone organizations from every region of the country, including national associations representing French-Canadian women, senior citizens, young people and parents. In 2013–14, the NFB completed 72 original productions and co-productions, comprising 52 documentaries, 19 animated films and one short fiction. The NFB also created 10 original Web productions and 18 films for these sites, in addition to two apps for tablets and four installations. The NFB received a total of 111 awards at a variety of Canadian and international festivals. Almost a quarter of these were prestigious honours such as Canadian Screen Awards, Prix Gémeaux, Webbys, and Writers Guild of America, Annecy International Animation Film Festival and Banff World Media Festival awards. The 40th anniversary of ACIC (Aide au cinéma indépendant – Canada) was highlighted by the Rendez-vous du cinéma québécois at a special evening during which that NFB announced that several independent productions supported by this program would be available for viewing on NFB.ca. In 2013–14, the NFB launched several noteworthy and high-profile documentary, interactive and animation projects. The web-based interactive documentary A Journal of Insomnia, which breaks the silence surrounding the distressing condition of insomnia by assembling the intimate stories of insomniacs from around the world, was launched online in April 2013 as part of the Storyscapes program, a new celebration of interactive storytelling at New York City’s Tribeca Film Festival. The interactive A Short History of the Highrise, the result of the first NFB partnership with The New York Times, was featured on the front page of the venerable US daily and further established the NFB’s leadership in documentary innovation through its inventive combination of linear film-viewing and the interactive format. In October 2013, at IDFA’s prestigious DocLab, the NFB launched the first narrative project creatively conceived for tablets and mobile users. An immersive, interactive reading experience, The Last Hunt uses animation and a soundtrack that changes in accord with varying narrative arcs to tell its story of aging family members, love and loss. In animation, Chris Landreth’s Subconscious Password, a playful and irreverent take on a common social faux-pas—forgetting someone’s name—was awarded the top prize at the prestigious Annecy festival. Jutra, an animated documentary by Marie-Josée Saint-Pierre, encapsulates the career of filmmaking legend Claude Jutra with a fresh approach to both form and content, and was selected for the Directors’ Fortnight section at the Cannes film festival. In addition to creating the 3D animated film Gloria Victoria, in 2013–14 acclaimed filmmaker Theodore Ushev completed the animated short Third Page from the Sun, an allegory for the upheaval the Earth is undergoing as a result of climate change. Oscar winner Torill Kove’s Me and My Moulton was in production throughout fiscal year 2013–14 and was released in June 2014 at Annecy. In May 2013, the NFB launched Secretariat’s Jockey, Ron Turcotte, a feature documentary about an iconic Acadian figure. The film tells the story of this francophone hero and horse lover from Acadia who rose to fame when he won the prestigious American Triple Crown in 1973 riding the celebrated Thoroughbred Secretariat. Secretariat’s Jockey had its world premiere in a packed house (800 people) at the Capital Theatre in Moncton. In March 2014, the NFB premiered the short animated documentary 54 Hours in St. John’s, Newfoundland and Labrador. The film recounts the tale of the 1914 sealing disaster that left 132 men stranded on the ice for 54 hours, resulting in 78 deaths. The scheduled debut showing was expanded into six back-to-back screenings, receiving prominent front-page coverage in St. John’s most widely read newspaper. Deeply ingrained in Newfoundlanders’ sense of identity, the story of the tragedy is taught as part of the province’s high-school curriculum. In its first week of online streaming at NFB.ca, 54 Hours was viewed more than 10,000 times. Other notable releases include: My Prairie Home, Chelsea McMullan’s feature documentary about transgender folk musician Rae Spoon, which premiered to sold-out crowds at the Vancouver International Film Festival and was selected to screen in competition at Sundance; NCR: Not Criminally Responsible by Emmy winner John Kastner; Le prix des mots by Julien Fréchette; and several titles mentioned in the 2013–14 RPP—Dennis Allen’s Crazywater, Vic Sarin’s Hue: A Matter of Colour, and the trilogy Michelle, Marie and Thomas by Robert Lepage and Pedro Pires. In preparation for the celebration of the Royal 22e Régiment’s 100th anniversary in October 2014, the NFB completed the documentary The Van Doos: 100 Years with the Royal 22e Régiment (formerly titled De Courcelette à Kandahar) by Claude Guilmain. The film employs soldiers’ letters and archival footage to examine the history of the first French-Canadian regiment, from its creation at the beginning of the First World War to its involvement in Afghanistan. In co-operation with the Governor General’s Performing Arts Awards and the National Arts Centre, NFB producers worked with filmmakers from across Canada to create seven short films celebrating the achievements of the laureates of the Governor General’s Performing Arts Awards (GGPAA). Directors Lisa Jackson, Marquise Lepage, Éric Morin, Simon Galiero, Rodolphe Caron, Kevin McMahon and Ann Marie Fleming captured the artistic spirit of this year’s recipients in their films, which were screened for an audience that included representatives from the arts, business and government sectors. Production also began on the eight films being made about the laureates of the next edition of the GGPAA, taking place in June 2014. Its 2014 release marking the NFB’s 75th anniversary, the feature documentary Shameless Propaganda, directed by Winnipegger Robert Lower, was inspired by original NFB commissioner John Grierson’s statement that the nascent agency had to “take Canadians by the throat and convince them they are a great people.” Lower explores the portrait of Canada created by early NFB films (1939–1945), searching for parallels with the Canada we know today. In consultation with the educational sector, in 2013–14 the NFB produced several works and events designed to address the curriculum needs of teachers. The launch of 54 Hours (detailed in the previous section) included a public screening program created in partnership with Newfoundland and Labrador’s public cultural centre, The Rooms, and was supported by online streaming as well as an educational strategy that positioned this short as a key component of curricula in all of the province’s schools. As part of a strategy to help young Canadians gain a better understanding of the French language and a greater awareness of its richness and diversity, the NFB launched a vast, nationwide contest, open to full-time Canadian high-school students aged 13 to 17, to promote its interactive website Ta parole est en jeu (produced in collaboration with the Université de Moncton’s Groupe des technologies de l’apprentissage). During the contest, almost 6,000 unique visitors explored the site, which received nearly 18,000 visits, and 2,300 youth signed up to experiment with a rich bank of words, idioms and accents. Exploring the world of the Deaf community and their efforts to win recognition for their distinctive culture and needs, Yves-Étienne Massicotte’s documentary Les mots qui dansent was completed in 2013–14, and will be launched on ONF.ca during La Journée mondiale des sourds. The film will also be made available via NFB Education’s online hub, CAMPUS, along with other resources on hearing impairment. The NFB worked with many Aboriginal artists and filmmakers across a wide range of genres and in both official languages. In fiscal year 2013–14, veteran NFB filmmaker Alanis Obomsawin completed Hi-Ho Mistahey!, an inspiring portrait of Shannen’s Dream, a popular movement fighting for equitable access to education for all Aboriginal children. The film premiered at the Toronto International Film Festival (TIFF), where Obomsawin was also honoured as part of the inaugural Birks Diamond Tribute to the Year’s Women in Film, presented in partnership with Telefilm Canada. At the Canadian Screen Awards, she received the Academy of Canadian Cinema & Television’s Humanitarian Award for her exceptional contribution to community and public service. Also in 2013–14, the NFB, in collaboration with the Aboriginal Peoples Television Network (APTN), launched the very first edition of the Nikanik Tremplin competition, open to French-speaking First Nations filmmakers from Quebec wishing to make their first or second documentary. The winning project was filmmaker Jean-Claude Therrien’s Alexandre Nikshan. A partnership between the NFB and Nunavut Film Development Corporation, the Digital North 1.0 initiative strives to build bridges with emerging Inuit creators, helping them to develop the creative thinking skills and knowledge of the processes and methodology required to tell stories in an interactive format. In 2013–14, two successful candidates (Bonnie Ammaq and Nyla Innuksuk) were each paired with an experienced digital creator to bring a web-based story to life. An NFB producer is currently working intensively with both to construct the foundations of their projects (respectively titled Christmas at Outpost Camp and Stories Through Strings, and to be completed during fiscal year 2014–15). Lastly, Similkameen Crossroads by Tyler Hagan is the second interactive release from the NFB/imagineNATIVE Digital Media Partnership, which supports new forms of Indigenous artistic expression and offers Canadian Aboriginal artists an opportunity to develop audacious, innovative and socially relevant new media works. Several NFB initiatives in 2013–14 supported the organization’s ongoing efforts to identify and mentor talented emerging filmmakers as they hone their creative skills. The third edition of the Cinéastes en résidence competition was launched in June 2013, receiving 107 applications, from which two finalists were selected: Vali Fugulin and Céline Baril. Beginning in fall 2013, these filmmakers will take up residence at the NFB for two years while they create projects characterized by innovative content, technology and/or distribution methods. The previous edition’s filmmakers, Carole Laganière and Danic Champoux, completed their respective films (Absences, Auto-portrait sans moi) in 2013–14. The English Program launched its ninth edition of Hothouse, a three-month apprenticeship in real-world animation filmmaking for emerging creators from across Canada. Hothouse participants each direct an animated short, guiding it from creative inception through to final sound mix and video release. Six projects were selected out of the 99 submissions sent in by filmmakers from across Canada and from both linguistic communities. The completed films will be released in 2014–15 and will be available online. In addition, the 21st edition of the Cinéaste recherché bi-annual competition took place in 2013–14 and was won by filmmaker Keyu Chen, who will have the opportunity to make her first professional animated film, entitled Printemps. In 2013–14, the NFB also played an active role in the professional development of Canadian filmmakers and media creators. In addition to offering workshops in interactive production for its production supervisors and technical coordinators, the NFB organized three DigiCamps (interactive production workshops) for its partners ARTE, France Télévisions, APTN and the Alliance des producteurs francophones du Canada. It also held two more workshops, one in the Acadian region for Acadian creators working in a variety of fields (writers, authors, etc.) and another in Wendake for young Aboriginal creators. Delivery mechanisms include the distribution, marketing and commercialization of audiovisual works via a diverse catalogue, a well-established stock footage library, the development of diversified markets (i.e. : theatrical, television, consumer and institutional) via online and traditional channels in Canada and abroad. These activities make works widely accessible across Canada, notably to underserved and remote communities, Aboriginal and Official language minority communities. NFB’s accessibility and audience engagement activities contribute to a dynamic Canadian culture and heritage. The NFB improved the methodology of its annual survey of the public by using a larger sample of online and offline respondents and expanding the scope of its questions. According to the results of the survey, 39 percent of Canadians had viewed an NFB production in the last year. This number is consistent with results in previous years. In 2013–14, the number of views of NFB works worldwide was 35.4 million, reaching the institutional target of 35 million one year ahead of schedule. This number represents a slight increase from the previous year’s 34.6 million views. In addition, the NFB recorded 228,051 online-registered consumers and 18, 358 customers, also surpassing its targets for the measurement of audience engagement. New targets will be set for both indicators in the 2015–16 Report on Plans and Priorities. Overall Canadian audiences declined by 4 percent (or 1.2 million views) in 2013–14, totalling 27.7 million views, in comparison with 28.8 million in fiscal year 2012–13. With the notable exception of television—which achieved a 17 percent increase in audiences in 2013–14— several access channels experienced decreases relative to the previous year. Canadian online viewing also declined by 7 percent in 2013–14, with cumulative combined views (including via NFB.ca, interactive productions and online partners) totalling 4.4 million, in comparison to 4.7 million in 2012–13. Decreases occurred in NFB.ca film views (down 15 percent in 2013–14) and interactive production views (down 17 percent). These declines were mitigated somewhat, however, by an increase in online partner views (up 38 percent in 2013–14). Canadian television audiences increased very significantly in 2013–14 to 11.3 million, representing a 17 percent overall increase (or 1.6 million views). This marks the second year in a row that Canadian television audiences have increased, following five years of successive year-over-year declines. Canadian educational and institutional audience views totalled 11.5 million in 2013–14, representing a 9 percent decline as compared to 2012–13. Accounting for 42 percent of the NFB’s total estimated Canadian audience in 2013–14, this market remains the NFB’s single largest audience sector (followed very closely by the television market). While the bulk of audiences continue to be generated via DVD units sold and in active circulation in educational and institutional contexts, non-theatrical DVD unit sales continue to decline (by 30 percent in 2013–14), and migration to online viewing continues to increase, with total CAMPUS subscriber views in 2013–14 amounting to 248,000, or a 15 percent increase over subscriber views last year (215,000). International online audience views for 2013–14 amounted to 7.7 million views (2.4 million via ONF.ca/NFB.ca, 4.7 million via online partners and 538,000 via interactive productions), representing a significant increase of 35 percent over the previous year’s total of 5.7 million. This increase is mostly due to significant increases in online partner views. Audiovisual revenues in 2013–14 continued to experience a decline in relation to previous years: a 17 percent decrease in comparison to 2012–13. The theatrical and institutional/educational markets were impacted the most, with decreases of 86 percent and 12 percent respectively. A more detailed revenue analysis is available on page 47. The NFB connects with its customers in a variety of ways, including commercial transactions, free screenings online, mailing lists and blogs. In order to be able to observe and understand user conversion and engagement, the NFB needs to funnel as many online interactions as possible through a more simplified login process that’s designed to facilitate the tracking of its visitors’ interactions. This will allow for a more cohesive methodology for analyzing user preferences. The lesson learned is that the better the NFB’s understanding of its customers’ online behaviour and preferences, and the better it manages its multiple interactions with them, the more opportunity it will have to increase revenues through targeted/personalized marketing. NFB productions, regardless of the work’s original source, are preserved and digitized in order to ensure their permanence and their accessibility to Canadians and the world, now and in future generations. This sub-program reduces the risks of technological obsolescence, minimizes the effects of time on the media on which works are recorded, and guarantees the physical security of works. Preservation and conservation require suitable tools and systems for identification, management, archiving and restoration. As Canadians’ media consumption migrates on-line, it is imperative that high-quality innovative Canadian content is available to them. Without a concerted conservation and preservation activity, this cultural heritage is at risk of loss. The NFB’s digitization and conservation plans for its collection have a common goal: to ensure the preservation of the collection for future generations in a format that will facilitate long-term access. The conservation plan aims to secure the contents of the NFB’s conservation vault by relocating components of its audiovisual assets to a second geographic location. In 2013–14, 2,458 titles were transferred to a separate location, for a total of 10,034 titles transferred. To date, 77 percent of the collection has been secured, and the NFB is on track to secure its entire collection by 2015–16. The NFB’s digitization plan is also on track. In fiscal year 2013–14, 244 digital-source image masters and 381 digital-source sound masters were created, as well as 227 digital image masters and 577 digital sound masters. The NFB also produced 1,299 mezzanine files for its works, totalling 4,294 files at the end of the fiscal year. A mezzanine file is a compressed digital file that is created from a digital master and used to produce the vast majority of deliverables. As of March 31, 2014, 55 percent of works in the NFB collection have a corresponding mezzanine file, and 40 percent of the collection has a digital source master. The Media Asset Management (MAM) system is an essential tool of the NFB’s digital transformation and will make it easier for the organization to manage its digital assets more effectively and ensure that works can be more quickly accessed by Canadians. The Information Technology, Research & Development, and Information Management teams, working with technology partner North Plains Systems, defined the infrastructure needed for the MAM to perform optimally. Once the required servers had been put into operation, North Plains’ TelescopeTM product was installed and made available for testing. One of the major challenges in this process was finding a way to convert information originating in the NFB’s various data systems into a format compatible with the separate-components management model that the organization has developed for managing digital assets. The NFB has also made progress in its efforts to implement a bridge between the old information systems and a new digital operating mode. With the work done in 2013–14, it will now be possible for all audiovisual components (photos, graphics, shooting elements, etc.) to be linked to a work from the very start and be readily exchangeable with outside parties for communication and marketing purposes. This new practice will allow the NFB to have an overview of all the materials connected to a film, before its completion. The increased storage requirements resulting from the NFB’s digitization plan have presented a challenge for the NFB’s storage infrastructure. To address this, the NFB acquired a new large-scale tape archive with a capacity four times greater than the current library. This acquisition improves the NFB’s storage capacity and the effectiveness of its operations. The new tape library will be dedicated to the digital production of projects, from inception through to delivery, and to the archiving of operations under the Digitization Plan, while the previous tape library will now be dedicated to housing backup files. This sub-program delivers Canadian audiovisual works to Canadian and international consumers. It exists to allow individual consumers to access and engage with Canadian cultural products that reflect our history and values and that interpret Canada to Canadians and to other nations. In so doing, national and international consumers share in a dynamic Canadian culture and heritage. Delivery mechanisms include the distribution, marketing and commercialization of audiovisual works via a diverse catalogue, the development of diversified markets and channels, i.e. : theatrical, television and Internet/mobile and hard goods in Canada and abroad. In 2013–14, the total number of consumer views of NFB content via several access channels exceeded 23.6 million, an 8 percent increase over last year’s 21.8 million views, mostly due to a 17 percent increase in television views. Overall decreases occurred across other core consumer-access channels compared to the previous year. The number of actual registered consumers is 220,083 and the number of customers is 12,724, surpassing the yearly targets established in 2012. New targets will be set for fiscal year 2015–16. The NFB increased the amount of free content it offers online and via mobile applications. In 2013–14, 256 English-language productions (films, clips and trailers) and 226 French-language productions were added to NFB.ca / ONF.ca. As of March 31, 2014, close to 2,900 titles were available for streaming online. The NFB improved its search engine optimization (SEO) strategies and enhanced the discoverability of content both within the NFB.ca/ONF.ca website and in relation to other content on the Internet. In addition, improvements were made to the NFB’s posting of external links, video embedding and to its indexing publishing practices, to avoid duplication of content on different websites. As of March 31, 2014, the plan to add new language channels to the NFB’s main Web portal (which currently exists in both official languages, as NFB.ca and its French-language counterpart, ONF.ca) had not been carried out, due to a change in strategy for the recently announced international documentary streaming platform (see details below). There will, however, be an increase in foreign-language content, following the recent subtitling of 39 NFB films in Chinese through a partnership with Phoenix New Media in China. Audiences now have greater access to NFB content, which is available via a rich variety of options such as free streaming, download-to-own (DTO), video-on-demand (VOD) and Premium VOD (new releases available for VOD just prior to or during a film’s first release window). Mobile applications were updated to ensure their availability on smartphones and tablets. In the connected TV market, NFB apps were added to products by manufacturers Panasonic, Roku and LG, and the NFB continued its connected-TV app partnership with Samsung. The NFB put in place improved data-management systems to enhance tracking and analysis of user behaviour and transactions on NFB.ca. In January 2014, Google Analytics (GA) was fully implemented on the site, giving NFB content creators as well as the marketing and distribution departments better access to system features and more customized reports. GA tagging standards were also formalized and implemented for interactive productions, allowing comparative viewing statistics between linear-film streaming and interactive production experiences. In addition, views on new platforms (including new smart TV applications, the McLaren app, and CAMPUS) can now be tracked and reported. In April 2013, the NFB announced an initiative to launch a new international multiplatform destination for viewing and engaging with the world’s best auteur documentaries. Conceived of as an integral part of NFB.ca, the service will be available via VOD and eventually by subscription, and include new forms of interactive documentary and feature content that is curated, bilingual and independently produced. With the business plan well advanced, the NFB tested the project in the marketplace and actively searched for global partners. Meetings were held with more than 25 companies, news-media organizations and technology companies, many of which were interested in exploring areas of collaboration. A team composed of various NFB units and partners is working to complete this project by early 2015. The NFB launched two iPad applications in 2013–14. Both were Apple Canada Editor’s Choice picks and have been popular with users and critics. The free McLaren’s Workshop app, which launched in June 2013, features 51 Norman McLaren films and 11 short documentaries and enables users to create their own animations employing the renowned filmmaker’s techniques. In the first week following its release, the application took its place among the top five apps in Apple Canada’s Photo & Video category. To date, McLaren’s Workshop is the most downloaded NFB app (more than 153,000 downloads by March 31, 2014). Also in 2013–14, the NFB launched StopMo Studio, a redesigned and updated stop-motion animation app for the iPad. Originally released as PixStop in December 2011, the app now includes more than 20 features and offers casual and expert users alike a unique creative experience as they animate images using the frame-by-frame stop-motion technique. StopMo Studio boasts new tools in both visual and audio editing, as well as the option of sharing with friends and family. For the eighth consecutive year, the NFB took part in the Rendez-vous de la Francophonie (RVF) as a distribution partner, providing RVF venues and participants with new French-language NFB productions that were shown at screenings across the country during the month of March 2014. This year, participation reached record levels: 300 screenings, including 273 in official-language minority communities. Events were held in 98 cities, in all the provinces and territories of Canada, with an overall attendance of more than 14,000 spectators. The NFB also partnered with Via Rail and CBC/Radio-Canada to launch an on-board entertainment program in July 2013, giving Via Rail passengers access to NFB works through a new interactive digital platform. Other ongoing strategic partnerships to increase the visibility of NFB content included those with Air Canada (on their in-flight program) and Aéroport de Montréal (on an exhibit of NFB photographs, films and animated works at Montréal-Trudeau Airport). As the world’s leading producer of Inuit films, the NFB has worked with artists and communities across the North to create a rich audiovisual legacy of Inuit and Arctic history, culture and stories. The NFB’s Inuit and Northern film collection was featured at various events that took place in Canada and abroad during fiscal year 2013–14. The Extraordinary Arctic Festival was organized by the Canadian Museum of Nature in partnership with the NFB and Students on Ice, and in collaboration with the National Arts Centre’s Northern Scene, the largest gathering of Northern artists outside the region, the Ottawa Inuit Children’s Centre, and Nunavut Sivuniksavut. Twenty-four new and classic NFB documentaries were featured in total, including a special screening of the 2012 film Vanishing Point, as well as animated shorts from each of the four Inuit regions—Nunavut, Nunavik, Nunatsiavut and Inuvialuit. Nearly 4,000 visitors also participated in an interactive igloo experience for children and families organized by the NFB Education team. The documentary Les Ailes de Johnny May (The Wings of Johnny May) premiered in August 2013 at the Land InSights Montréal First Peoples Festival. It is the 12th NFB film made in Nunavik (northern Quebec) to be added to the Unikkausivut: Sharing Our Stories collection. The collection is also receiving significant international exposure thanks to ongoing relations with Foreign Affairs, Trade and Development Canada. Under the auspices of the Canadian embassy in Stockholm, the makers of Point de fuite (Vanishing Point) have been touring Scandinavia with their film. They have shown it in Reykjavik, Helsinki, Oslo and Stockholm. In addition, the Canadian embassy in China requested a number of titles from the Unikkausivut collection which had previously been subtitled by Phoenix New Media. The films were screened at a number of events in universities in and around Beijing, attended by more than 30,000 people. The NFB’s partnership with the Truth and Reconciliation Commission continued in 2013–14 with the launch of the feature-length documentary We Were Children at the National Event in Montreal in April 2013. Three free public screenings were held and the Government Film Commissioner and NFB Chairperson, on behalf of the NFB and co-producers Eagle Vision and eOne, offered the film as an Expression of Reconciliation during the Call to Gather. We Were Children reflects the NFB’s commitment to Aboriginal filmmaking and the use of digital media for transmitting and preserving essential stories and giving a voice to under-represented communities and individuals. The NFB was a partner of choice for outreach activities in downtown Montreal and the Quartier des Spectacles. An agreement was signed with Place des Arts to adapt a free public installation at the Espace culturel Georges Emile-Lapalme, a large indoor public area located between Place des Arts Metro and Complexe Desjardins, where millions of people gather throughout the year. In collaboration with Moment Factory, the NFB also launched the Megaphone installation in the Quartier des Spectacles, inviting citizens to express themselves on topics of concern to them. In addition to amplifying the speakers’ voices, Megaphone transformed their words into images that were projected onto the façade of UQAM’s President Kennedy pavilion. A website was also created to support the installation and promote a diverse range of programming. A third project, McLaren Wall-to-Wall, was commissioned to celebrate the genius of Canadian filmmaker Norman McLaren (see page 41 for more info). Finally, the NFB collaborated with the Montreal International Documentary Festival (RIDM) during the annual Nuit Blanche event. This sub-program enables Canadian and international educational and institutional groups to provide Canadian cultural products and their inherent values to their members and students. It supports the distribution and the use of Canadian audiovisual works and content, which include educational workshops and pedagogical activities to Canadian and international educational and institutional audiences. NFB productions and content must be widely accessible, promoted and distributed to Canadian and international Educational markets (teachers, schools, school boards, colleges, universities and ministries of education), as well as Institutional markets (public libraries, social and health services, community and cultural associations and businesses) to engage Canadian youth and to support their educational activities. Delivery mechanisms include the distribution, marketing and commercialization of audiovisual works via a diverse catalogue, the development of diversified channels, i.e. : Internet, mobile and hard goods in Canada and abroad. The NFB’s education offer contains Canadian content in both official languages, evaluated by Canadian teachers who match it to curricula in Canadian schools. In 2013–14, the NFB worked with educators and subject-matter experts across the country to develop and enhance its online education hub, CAMPUS. Following feedback from educators and partner organizations, extensive new resources have been developed that address topics such as Polar Education, the Prime Ministers of Canada (in partnership with Library and Archives Canada), Interdisciplinary Space Exploration, Canada’s Indian Residential Schools, Urbanization, LGBTQ themes with a specific focus on transgender-related issues, Body Image, and Holocaust Education. These resources can be accessed online by CAMPUS users. A high-level evaluation of the current environment in the North American educational and institutional market was completed. The NFB has begun to develop key relationships by participating in important US educational events such as ISTE, SXSWedu and the National Media Market. A soft launch for CAMPUS US is slated for September 2014, and further business development will take place in the fall of 2014. The NFB Education team will create a strategy for the US educational and institutional market that includes traditional sales, online streaming and CAMPUS subscriptions. In response to educator feedback, the NFB developed two key new CAMPUS features. The first addressed the need for student access, allowing teachers to share playlists, chapters and entire films with their students for home viewing. Work was also done on the development of Learning Bundles—collections of films, clips, resources and external links that are searchable by theme, subject and grade level. A mobile version of CAMPUS was not pursued due to a lack of uniform equipment across Canadian schools and the fact that most schools are still using laptop and desktop computers for classroom work. In 2013–14, the NFB acquired 389 films to supplement its educational film collection on CAMPUS. These titles, which will be added to CAMPUS throughout the summer of 2014 and made available to educators in fall of 2014, will be promoted in the annual NFB Education catalogue and highlighted within the site’s new Learning Bundles. The NFB developed partnerships with several key distributors and producers, including Mongrel Media, ZED, DHX Media, DLI, Les films 3 mars, Bunbury Films, NHK, Apartment 11, Icarus Films, EyeSteelFilm, and others. Partnerships were consolidated with Mindfuel (formerly Science Alberta Foundation) and Library and Archives Canada for the sharing of films and resources on CAMPUS. Created in partnership with the Canadian Space Agency (CSA) and the Canadian Museum of Nature in Ottawa, the NFB Space School Virtual Classroom on October 16 consisted of two one-hour events (one in French and one in English) featuring retired astronaut Commander Chris Hadfield. Approximately 26,000 students from across Canada took part. On October 17, in partnership with the Legacy of Hope Foundation and the Ottawa-Carleton District School Board, a professional development session was held for educators teaching topics addressed by the NFB film We Were Children. During the session, 53 online participants and 25 educators learned techniques to assist them in teaching about Canada’s residential schools using stories of personal experience and resilience. A Virtual Classroom entitled “Tapped Out: Our Right to Safe and Healthy Water” was presented in partnership with the David Suzuki Foundation on November 19 and 20 in Vancouver, B.C. The event’s speakers included David Suzuki, CBC Meteorologist Johanna Wagstaffe, and Olympic medalist Adam van Koeverden. A total of 80 schools from across the country (representing approximately 8,000 students) participated in this Virtual Classroom over a period of two days. The International Holocaust Remembrance day Virtual Classroom was developed by the NFB in partnership with Citizenship and Immigration Canada. A professional development event designed for teachers of Grades 9–12 and CEGEP-level courses, the classroom gave educators a valuable opportunity to discover new approaches to teaching about the Holocaust and the many lessons it offers on human rights, racism, democratic values, citizenship and genocide. The English version of the event was held on International Holocaust Remembrance Day, January 27, and the French version took place on February 3. NFB Education workshops attracted close to 24,000 participants, comprising 21,000 students and 3,000 teachers. Seven-hundred-and-sixty individual workshops were delivered in the last fiscal year, onsite at the NFB’s Toronto and Montreal offices as well as off-site at film festivals and education conferences across Canada. NFB Education Specialists travelled to British Columbia, Saskatchewan, Manitoba, Ontario, Quebec and Prince Edward Island to offer hands-on workshops for students, professional development sessions for educators, and various webinars. They also took part in conferences across Canada and gave workshops in several official-language minority communities through partnerships with DREF (Direction des ressources francophone) in Manitoba, the Association canadienne d’éducation de langue francaise (ACELF) in Regina and West Island College in Montreal. The NFB has also developed an important teaching aid about the Canadian polar region: the Polar Educator’s Guide (Guide d’éducation polaire), for use in teaching about the Canadian Arctic and the people who live there. The guide will be included with the NFB’s Unikkausivut DVD box set. Other plans to showcase this collection in an educational network (with related educational materials) were postponed due to governance changes in Nunavik and Nunatsiavut and changes in the priorities of the Canadian Polar Commission. The NFB continues to serve the institutional market (public libraries, government departments, policing agencies and correctional facilities, health and social service organizations, museums and art institutions, private businesses and community-based non-profit organizations), making its productions easily accessible to these groups in both official languages. In 2013–14, it distributed 2,146 DVDs to more than 400 institutions, with 1,417 DVDs going to over 100 public libraries. Additionally, 2,340 NFB Film Club screenings were held in 211 public libraries across the country in both official languages, reaching 27,000 Canadians. And between September 2013 and March 2014, 60 productions were presented in 59 screenings through the ONF À LA MAISON in Montreal, reaching a total of 2,500 people. Through this sub-program, the NFB enables the Canadian and international audiovisual industry to participate in the promotion of Canadian culture and heritage via private and public sector partnership. These partnerships facilitate the exchange of knowledge and creativity, foster a close collaboration with industry in major festivals and markets (ie. MIP, BANFF, Hotdocs, Sunny Side of the doc) through panel discussions, Q&A, competitions, awards, etc.). Activities also include the marketing and promotion of NFB audiovisual works and thematic compilations in major national and international festivals/markets as well as events of significance (such as Oscars nominations, World Expositions, Québec City’s 400th anniversary), and the marketing and promotion of retrospectives of the NFB and its notable filmmakers (Norman McLaren, Pierre Perrault, Alanis Obomsawin). NFB productions were screened at more than 150 major festivals around the world, with new films submitted to prestigious festivals such as Sundance, Berlin, Cannes, Annecy, Venice, the Toronto International Film Festival, the International Documentary Film Festival Amsterdam and Hot Docs. In 2013–14, the NFB also partnered with several Canadian festivals, including Hot Docs, Future. Innovation. Technology. Creativity. (FITC), the Ottawa International Animation Festival (OIAF), imagineNATIVE, Montreal International Documentary Festival (RIDM), Festival international du cinéma francophone en Acadie (FICFA), Regards sur le court métrage de Saguenay and the Rendezvous du cinéma québécois (RVCQ). In addition, the NFB formed a first-time partnership with C2-MTL, a three-day business conference in Montreal featuring world-renowned speakers, interactive exhibits, and collaborative workshops with the goal of fostering cooperation and the emergence of innovative business solutions. As an experienced partner, the NFB signed a licensing agreement to exhibit the Barcode installation. Several activities took place in celebration of the 100th anniversary of the birth of Norman McLaren, renowned filmmaker and founder of animation at the NFB. A Canadian of Scottish descent, born in Stirling in 1914, McLaren is widely regarded as one of the trailblazers of animated film, earning worldwide recognition for his innovative work at the NFB from 1941 to 1983. McLaren’s landmark short, Neighbours/Voisins, is a UNESCO world heritage work. First, in June 2013 the NFB launched its free iPad app McLaren’s Workshop at the prestigious Annecy International Animation Film Festival. The app includes many of McLaren’s films and allows users to experiment with his pioneering animation techniques (see page 33 for more information). Also in 2013–14, the NFB partnered with the festival to prepare three curated programs featuring some of McLaren’s best films, paired with works by contemporary artists (McLaren’s “artistic heirs”). The programs were presented in June 2014. In collaboration with the NFB, Ex Machina and Robert LePage, the original Image Mill project (the largest architectural projection ever created, shown in the old Port of Quebec) was transformed to pay tribute to the works of McLaren, exploring his career and his artistic and creative process. Approximately 150,000 people experienced this final edition of The Image Mill project, which was initially created as part of the festivities surrounding the 400th anniversary of Quebec City in 2008. Other commemorations of McLaren’s centenary included a partnership with Montreal’s Quartier des Spectacles on McLaren Wall-to-Wall, a project comprising a total of seven video works projected onto seven different building façades in the city’s centre from April 11 to June 1, 2014. Finally, as part of the NFB’s 75th-anniversary celebrations, the Musée de la Civilisation in Quebec City has dedicated a major exhibit to NFB animation, on display from June 4, 2014, to August 23, 2015. Entitled Frame x Frame: Animated Film at the NFB, the exhibit highlights the NFB’s role as a creative force and leader in the animation field. The NFB partnered with the Musée to create this spotlight and to help shape the museum-goers’experience, and is still actively involved in the development of the project, which was funded by the two organizations. NFB Internal Services supports the organization’s efforts to achieve its strategic outcomes and carry out its two programs: Audiovisual Production, and Accessibility and Audience Engagement. Below are the results of Internal Services’ main projects for 2013–2014. Fiscal 2013–14 saw the launch of a new five-year Strategic Plan. Implementation of the plan began with a list of combined actions outlined in the 2013–2014 RPP, in the areas of internal communications, change management and performance management. It was crucial for senior management to adopt a consultative approach to the development of an action plan. In December 2013, the Acting Commissioner announced a series of work sessions with managers, supervisors and each and every employee in order to ensure a common understanding of and buy-in for the action plan. For example, a meeting was held with all managers in mid-March. This enabled them to share information and have a constructive discussion, after which they invited their teams to find the best way to ensure regular follow-up on all the different projects stemming from the Strategic Plan. The results were very positive and even showed the added value of holding this type of exercise on a yearly basis. Some of the highlights in issues related to change management are noted above. The NFB carried out elements of its internal communications plan by increasing the sharing of information in general, and particularly with regard to information on the corporate action plan for the coming year. Another notable result in 2013–14 was the launch of the leadership development program for managers. Several training modules have been given so far, including the “Motivational Communication” workshop, the “Optimal Performance” workshop (on the role of ongoing feedback in performance management) and the “SMART Objectives” workshop (on establishing performance objectives). These last two workshops were held concurrent with the performance-appraisal process, thus supporting the participants in their managerial role. The NFB did not undergo a MAF assessment in 2013–14; it will take place in 2014–15 instead. The TBS began the process in June. The NFB is one of 60 small and large government departments and agencies that will participate in the assessment, and its departmental coordinator has attended the interdepartmental sessions given to date. The headquarters relocation project has been postponed. It will eventually be revisited, with a new timetable drawn up in collaboration with PWGSC. In regard to office accommodations, the NFB continued to implement the measures announced in the 2012 Federal Budget. The amount of space the NFB occupies has been reduced as a result of the closing of the CineRobotheque in Montreal and the Mediatheque in Toronto. An initiative to reduce space at the Halifax office is also underway and will be completed in summer 2014. The main risk identified in the Business Impact Analysis (BIA) is the loss of the NFB’s film collection. Measures have been taken to safeguard the collection in the event of an accident or incident. A copy of each work will be stored in at least two different physical locations. The bulk of the collection (77 percent) is now available in two locations. The drafting of a formal Business Continuity Plan has been postponed. Policy on Internal Control Action Plan: Additional controls were implemented in 2013–14. These include informing all employees about the NFB Purchasing Policy and conducting an audit of all user accesses to the Oracle system. The NFB completed the compliance analysis for the common financial-management business processes and concluded that it was for the most part in compliance. An action plan was prepared to address the areas the analysis identified as requiring improvement. The NFB successfully implemented the Shared Travel Services. The transfer of payroll services to Miramichi began during the year. This transfer was divided into four employee groups; the first two groups have been completed and the other two groups will be transferred during 2014–15. The modification of the media asset management system began in 2013–14. It will be recalled that the objective is to adapt the existing systems to cope with the increasing digitization of data and the NFB’s various media management and processing activities. The new system should become operational in 2014–15. This year, the NFB evaluated the impact of its emerging filmmaker programs and part of its international outreach activities (festival participation). These two evaluations are available on its institutional website. Last fall, the NFB also deemed it essential to review its evaluation plan in light of its strategic priorities and the work accomplished since the plan was filed in 2011. Following this review, the NFB submitted a revised plan to the TBS in March 2014. The revised evaluation plan is better adapted to the realities—and the capabilities—of the organization: among other things, it takes into account the impact of initiatives such as the 2012 Budget measures on the NFB’s resources. Overall, expenses for 2013–14 were less than what was planned and less than the previous year’s expenses. Indeed, cash participations in co-productions were lower than expected while the savings in rent were higher than planned. The significant decrease between 2012–13 and 2013–14 reflects a full year of downsizing and savings on rent following the closure of the viewing posts and cinema facilities in Montreal. The expected revenues for 2013–14 included anticipated revenue from the launch of CAMPUS in the United States and internationally. The project has been postponed to 2014–15. Also, phase II of Unikkausivut, the Inuit audiovisual heritage collaboration with Canada’s three main Inuit regions, has been postponed to a later date. In 2012–13, phase I of the project generated $305,000 in revenues. Sales of digital products are not growing as quickly as had been anticipated to compensate for the continual decline of traditional products. The significant increase in the net departmental financial situation is primarily explained by the severance pay cash-out following the end of the accumulation of funds as of 2012. Indeed, over 75 percent of employees opted for the immediate cash-out option rather than at retirement. Also, in 2012–13, net liabilities included a provision for terminating the lease of the viewing posts and cinema facilities in Montreal, an initiative included in the implementation of the cost-saving measures of the 2012 Budget. Despite the permanent reduction in parliamentary authorities, the NFB is continuing its efforts to maintain and increase the funds allocated to programs and sub-programs and the results show a constant proportion of expenditures by major sectors from year to year. Theatre sales revenues for 2012–13 included the amount of $300,000, generated by the hit film Stories We Tell. Sponsored production and pre-sales revenues for 2013-14 are derived from partnership agreements for several projects, in particular with the Canadian Race Foundation and the University of Alberta at the English Program and the Quartier des Spectacles in Montreal at the French Program. Various revenues for 2013–14 included, for the first time, profit sharing from the partnership owned by the NFB (14%) in the Canadian Broadcasting Corporation (CBC) in conjunction with the 2002 limited partnership agreement with the Documentary Channel. The consumer market is undergoing a major transition to digital formats, especially with the online availability of several titles on Netflix and YouTube while the gradual decrease in DVD sales continues. Television sales for 2013-2014 remain at the same level as the previous year and include several broadcasting contracts, including a total of $193,000 for Stories We Tell, and an $80,000 licence with NHK for China 2000 B.C. Educational and institutional revenues remain at a level comparable to 2012–13. The ongoing performance of CAMPUS in Canada as well as new sources of revenues such as virtual classrooms, and in particular the success of the classroom with Colonel Chris Hadfield, helped lessen the impact of the price decrease for physical products (as a result of Bill C-11) in this market. The DigiCamp offering (interactive production workshops) generated $106,000 in revenues with several sessions provided over the course of the year to France Television, ARTE France, the Aboriginal Peoples Television Network and the University of Alberta. In 2012–13, revenues included $305,000 generated by the Inuit audiovisual heritage project. The supplementary information tables listed in the 2013–14 Departmental Performance Report can be found on the National Film Board’s websiteiv. The tax system can be used to achieve public policy objectives through the application of special measures such as low tax rates, exemptions, deductions, deferrals and credits. The Department of Finance Canada publishes cost estimates and projections for these measures annually in the Tax Expenditures and Evaluationsv publication. The tax measures presented in the Tax Expenditures and Evaluations publication are the sole responsibility of the Minister of Finance. budgetary expenditures: Include operating and capital expenditures; transfer payments to other levels of government, organizations or individuals; and payments to Crown corporations. Departmental Performance Report: Reports on an appropriated organization’s actual accomplishments against the plans, priorities and expected results set out in the corresponding Reports on Plans and Priorities. These reports are tabled in Parliament in the fall. full-time equivalent: Is a measure of the extent to which an employee represents a full person-year charge against a departmental budget. Full-time equivalents are calculated as a ratio of assigned hours of work to scheduled hours of work. Scheduled hours of work are set out in collective agreements. Government of Canada outcomes: A set of 16 high-level objectives defined for the government as a whole, grouped in four spending areas: economic affairs, social affairs, international affairs and government affairs. Management, Resources and Results Structure: A comprehensive framework that consists of an organization’s inventory of programs, resources, results, performance indicators and governance information. Programs and results are depicted in their hierarchical relationship to each other and to the Strategic Outcome(s) to which they contribute. The Management, Resources and Results Structure is developed from the Program Alignment Architecture. non-budgetary expenditures: Include net outlays and receipts related to loans, investments and advances, which change the composition of the financial assets of the Government of Canada. performance: What an organization did with its resources to achieve its results, how well those results compare to what the organization intended to achieve and how well lessons learned have been identified. performance indicator: A qualitative or quantitative means of measuring an output or outcome, with the intention of gauging the performance of an organization, program, policy or initiative respecting expected results. performance reporting: The process of communicating evidence-based performance information. Performance reporting supports decision making, accountability and transparency. planned spending: For Reports on Plans and Priorities (RPPs) and Departmental Performance Reports (DPRs), planned spending refers to those amounts that receive Treasury Board approval by February 1. Therefore, planned spending may include amounts incremental to planned expenditures presented in the Main Estimates. plans: The articulation of strategic choices, which provides information on how an organization intends to achieve its priorities and associated results. Generally a plan will explain the logic behind the strategies chosen and tend to focus on actions that lead up to the expected result. priorities: Plans or projects that an organization has chosen to focus and report on during the planning period. Priorities represent the things that are most important or what must be done first to support the achievement of the desired Strategic Outcome(s). program: A group of related resource inputs and activities that are managed to meet specific needs and to achieve intended results and that are treated as a budgetary unit. results: An external consequence attributed, in part, to an organization, policy, program or initiative. Results are not within the control of a single organization, policy, program or initiative; instead they are within the area of the organization’s influence. Program Alignment Architecture: A structured inventory of an organization’s programs depicting the hierarchical relationship between programs and the Strategic Outcome(s) to which they contribute. Report on Plans and Priorities: Provides information on the plans and expected performance of appropriated organizations over a three-year period. These reports are tabled in Parliament each spring. Strategic Outcome: A long-term and enduring benefit to Canadians that is linked to the organization’s mandate, vision and core functions. sunset program: A time-limited program that does not have an ongoing funding and policy authority. When the program is set to expire, a decision must be made whether to continue the program. In the case of a renewal, the decision specifies the scope, funding level and duration. target: A measurable performance or success level that an organization, program or initiative plans to achieve within a specified time period. Targets can be either quantitative or qualitative. whole-of-government framework: Maps the financial contributions of federal organizations receiving appropriations by aligning their Programs to a set of 16 government-wide, high-level outcome areas, grouped under four spending areas. 7 – Type is defined as follows: previously committed to—committed to in the first or second fiscal year prior to the subject year of the report; ongoing—committed to at least three fiscal years prior to the subject year of the report; and new—newly committed to in the reporting year of the RPP or DPR. 8 – To be considered “emerging,” it must be the filmmaker’s 1st, 2nd or 3rd film. 9 – Financial and human resources information are presented at the program level in order to be consistent with the 2013–2014 RPP, and will be presented at the sub-program level starting in 2014-2015. 10 – Registered Users are those who have opted into a non-transactional relationship with the NFB by providing contact information, registering as fans (i.e., through Facebook), subscribing to NFB newsletters or channels, creating an online NFB profile, etc. ; Customers are individuals or organizations who have had paid transactions with the NFB. 11 – Includes theatrical views. It is important to note that 2012–13’s exceptional results were driven by community screenings held in conjunction with Canada Day celebrations and the 100th anniversary of the Calgary Stampede, which alone resulted in almost 1.4 million views. 12 – Does not include partnership revenues, revenues from NFB centres and other miscellaneous revenues.